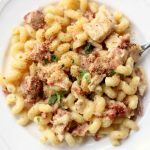 All the delicious flavors you love from chicken cordon bleu in a quick and easy pasta dish made in your electric pressure cooker. We scraped the pot clean…no leftovers on this recipe! Pour water into the Instant Pot. Add in the chicken base and the chicken. Add in the pasta noodles evenly. Try to have the water cover them as much as possible. Sprinkle in the ham, onion powder, garlic salt and pepper. Cover the Instant Pot and secure the lid. Make sure valve is set to sealing. Set the manual/pressure cook button to 3 minutes. When the time is up let the pot sit there for 5 minutes and then move the valve to venting. Remove the lid and stir in the cheese, bacon and half and half. It might be a little runny at first but the liquid will soak into the pasta in a few minutes. Scoop pasta into dishes and serve. Top with toasted breadcrumbs, if desired. Pasta–I used my favorite twisty cavatappi pasta that I find at Smith’s (Kroger). You can also use cellentani pasta or penne. Cheese–to make it more like chicken cordon bleu you can use shredded Swiss cheese. I ended up using mozzarella cheese because that’s what I had on hand. I also think a combo of mozzarella and parmesan would be tasty. Bacon–I had a big bag of bacon crumbles in my fridge (I buy it from Costco) so I added bacon to the pasta dish to really push it over the edge. If you want to leave the bacon out you totally can. It just adds more flavor. Toasted Bread-Crumb Topping: process 2 slices of white sandwich bread in the food processor to coarse crumbs, melt 2 Tbsp butter in a skillet over medium heat. Add bread crumbs and toast, stirring often, until golden brown, 5-7 minutes. Transfer bread crumbs to bowl and season with salt and pepper to taste.